It’s like a set of split rings. You can fit any one of them into any other. Each ring or each plateau ought to have its own climate, its own tone or timbre. I would like to begin my essay by mentioning a book for young people written over 60 years ago by the once highly esteemed popularizer of science Tadeusz Unkiewicz, the first editor of the journal Problemy. I have in mind Podróże mikrokosmiczne prof. Rembowskiego (The Microcosmic Travels of Prof. Rembowski; first edition 1956, second edition 1962), a short book bordering between science, science fiction and adventure, in the spirit of Jules Verne, and directly invoking the legacy of the author of 20,000 Leagues Under the Sea. What are important here are the titular “microcosmic travels” undertaken by Polish inventor and professor of biology Jan Rembowski and his younger companion and nephew, the fifteen- year-old Syga. As their travels are “microcosmic,” those journeys involve things that are small or miniature, and thus fulfil at least three centuries of daydreams about fathoming the mysteries of the microworld: the world at the level of viruses, bacteria and cellular life. “now I am merely clarifying,” the professor explains to the young assistant before their first journey, “that my purpose was to reduce the human being’s sight, reduce it in such a way that he would see, for example, a bacterium from the bacterium’s point of view, and so in such a way as if the human being were himself a being belonging to that ‘little world.’ But I was not content with the situation of an observer remaining motionlessly in one place. I needed to do something more. I needed to acquire freedom of movement. Thus an external control system was developed using the prototype of a kind of joystick and heat insulation enabling enclosure within a microorganic artificial eye, henceforth charged with directing the traveller’s cognitive apparatus. From the outside, this looks very strange: the explorer, wearing an enormous helmet that attaches him to a microscope, sits immobile next to the machine, while somewhere in the microworld, in the Elmis (short for electro-micro-scuba), his “third eye,” exposed to all the dangers of collisions, fissures, and conflicts with other organisms, takes a journey. The story is far from banal and transcends the realm of tales for children, especially if we consider the oculocentric fantasies of modernity: the eye separated from the body, prosthetic, reduced to the size of a single cell, travelling through organic space, looking inside what is generally hidden in darkness, into the very Inside. With their heads concealed in helmets, the microcosmic travellers are dead ringers for the contemporary human being, plunged into virtual reality, with a slightly overgrown version of Oculus Rift on their heads (making them a postmodern reboot of Acephalic Man?). However, what seems most intriguing about the physioscope is not its capability of “magnifying” the world or “reducing sight,” but the impression of full immersion that it creates. “I can see… I can see… I can see…,” an enraptured Syga declares at first. “I’m in water… as if in water… I feel entirely as if it were surrounding me…”. It is possible to lose oneself in this feeling, and that is, naturally, the fate that meets the young hero, who decides to journey alone into the dangers of microspace instead of heeding the professor’s warning. The microscope cannot be damaged from the outside, because it is protected from the haphazard movements of the human body, but Elmis is subject to damage from the inside in the microworld, e.g. if it collides with other devices or organisms. And as happens in cases of full immersion, a fissure in the artificial eye will have the inevitable effect of sending false nerve impulses to the brain, disturbing the proper functioning of human organs (here we reach a layer fascinating to Gilles Deleuze, who will reappear several times later in the text). That is why “microcosmic travels” are, as the professor warns, deadly dangerous. Syga nearly pays for his imprudent excursion with his life, and though he is successfully saved in the end, he loses the sharpness of vision in one eye permanently. Is this just an accident, or punishment for disobeying his elders, for imprudence, or is it in fact a Biblical reference, an allegory of disgrace, the equivalent of Jacob’s broken hip (Genesis 32:25)? Jan Rembowski and the young boy Syga would not trade this adventure for any treasures in the world; furthermore – they are preparing for new trips into the depths of the little world, deep inside a drop of water, in order to examine the life and laws of this little cosmos. And they do so unafraid, despite the dramatic and even tragic dangers and experiences that nature, who guards her secrets jealously, has left in their path. Orpheus can do anything except look this “point” in the face, look at the centre of the night in the night. I would not want to erroneously suggest that studies of literary phenomena in the categories of “mini” and “micro” were born in Silesia at the beginning of the third millennium, since they in fact fall within a tendency that has been active in the humanities for a half century now. We have simply tried to integrate Gaston Bachelard’s “microcriticism,” Jean-Pierre Richard’s “microreading,” Jakobson’s “microscopy” and Barthes’ theory of punctum with some other concepts of micropoetics or microscopic phenomenology, found at the border of literary criticism and philosophy – in the writings of Walter Benjamin, Theodor Adorno, Jacques Derrida, Jean-François Lyotard. Around the same time we saw the publication of the first editions of Ewa Domańska’s Mikrohistorie (Microhistories, 1999), Przemysław Czapliński’s “micrological” studies (Mikrologi ze śmiercią, Micrologues with Death, 2001) and Piotr Michałowski’s Miniatura poetycka (Poetic Miniature, 1999), and in the Polish context everything came under the sign of Jolanta Brach-Czajna’s Szczeliny istnienia (The Cracks of Existence, 1992), an academic-essayistic reflection on trivial things, scraps, objects and activities that can grow to the proportions of existential precipices (the cracks of the title). The “new” history, defined by me as “alternative history,” has proposed other approaches (different from the traditional modernist one) to the past and a different panorama of that past. It tells of the human being who was “thrown into” the world, of human existence in the world, of the human experience of the world and of the forms of that experience. It is thus a history of experience, a history of feelings, of private microworlds. We get to know the human being and his fates by means of cases, “miniatures,” anthropological stories which allows us to probe the texture of everyday reality. The anthropologist of everyday life does not have to conquer in order to make his report, as did, for example, Cortez, that is, to act as if the only purpose of conquest were to write a report. […]. The anthropologist of everyday life makes “little conquests” and reports on them not so much to Your Highnesses as to himself. […] The reports tell about the world rather than classifying it. What rules by means of these tales, in guaranteeing a cohesion of ordinary experience, is the logic of things and events “for us” rather than a logic of concepts. Nawarecki’s “black micrology,” created based on the idea of a bow toward Jacques Derrida’s “white mythology,” referring us simultaneously to the problem of the mortality of beings and the fragility of things, thus appeared at a curious moment in the development of our humanities, where at the borderline between deconstructionism, already employed in interpretative practice, and the free exploitation of elements from what is often broadly called “French theory,” but before the “cultural turn” that arrived through the mediation of its promotion and dissemination by Kraków scholar Ryszard Nycz and the KTL circle. There was still a proposal for classical philology after the linguistic and post-structural turn, with important elements of close reading, but it already had perceived the tendency to move away from literary texts toward cultural phenomena, from meaning and its adventures toward various other forms of experiencing literature, readership or personal engagement in the topic of study. Micrology itself is invoked with reference to Lyotard, who, having made a thorough study of avant-garde tendencies toward minimalism, weighed it down with the burden of sublimity and residual responsibility for filling in the gaps in the great Enlightenment project of reason. “Micrology,” Lyotard wrote, “is not just metaphysics in crumbs […]. Micrology inscribes the occurrence of a thought as the unthought that remains to be thought in the ‘decline’ of great philosophical thought.” Micrology is here thus not so much a method as a duty, a task to be carried out and a summons to think that which hitherto had no place in modern discussions (Nawarecki himself repeatedly asserts that it is certainly no methodology but rather a “dimension of thought,” a “perspective,” a “formulation”). This road leads through Theodor W. Adorno and Walter Benjamin all the way back to the German Romantics, to Schlegel, Novalis and Franz Schubert. The poetics of the fragment bears witness to the fragility of existence, the love for collecting small objects, a kind of passion for knick-knacks, it pays tribute to the Angel of History, saving the crumbs that settle, the material traces left by operations of the human spirit (that was in fact the accent of Nawarecki’s first “micrological” work, on the imagination and objects of the Skamander poets). 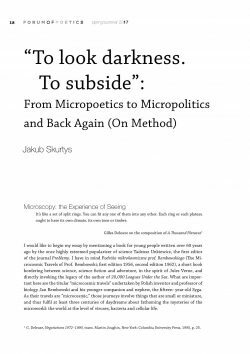 A minor change of perspective in the foreword to the final volume of Mikrologie from 2005 pushes this venerable procession of authoritative masters into the shadows, however, and the essay concentrates, exactly like Sulima’s, on the scholar himself, on the microfiber washcloth he is holding, on the order of everyday life, and forces us to ask the question “What kind of washcloth is that?” This is no longer a space of reflection on literature, but an exercise in the anthropology of small things, “small stories,” at the intersection of texts and cultural practices. A similar rupture can likewise be seen in a work cited by Nawarecki, Przemysław Czapliński’s Mikrologi ze śmiercią. And we see such a rupture heralded by the fabricated, encyclopedic defintion of the word “micrologist” on the book’s back cover, an homage to scientific scrupulosity and truly Enlightenment objectivity, that in subsequent developments will commit a creative betrayal and stick to “a reading based on the particles of the text,” which “involves entering the cracks in the work, engaging in readerly bustle, incessant circulation from grand narratives to small ones.” That is not only a methodological proposition, defining a way of reading and interpreting that turns out to contradict twentieth- century ideals of scholarship; it is a particular egalitarian and nonviolent philosophy of being and simultaneously a theoretical conceptualization of unbinding but nevertheless cognitively productive activities whose space remains everyday life, and whose basic technique is pragmatic assimilation. the focus of micrology’s interests will be the microstructures of literary works, which, however, need not (though they can) be understood as systemic elements of a work’s macrostructure. In this sense, micrology becomes synonymous with micropoetics: it is thus a discipline that borders on descriptive and historical poetics, that is, a tool that can have applications in studies in immanent, normative, or generative poetics, or in confrontations of formulated poetics with immanent poetics. Is not this manneristic minuteness, blind pedantry, obsession with trifles not the eternal disease of born scholars of literature? Minuteness that seems childish or sclerotically senile is the style of reading, after all, as inquisitive as it is light-hearted, that Barthes holds up as a model. Where the first of the tendencies described is associated with the discovery of the microscope, on which rests the promise of discovering the foundations of reality still rests, and the micrologist, scholar of particles, the executor of Jakobsonian precision and strategies of “microscopy,” remains the subject, the second is identified with the imagined figure of the micronaut, the shrinking man, who with Vernean fervour explores a dangerous and unknown world, even if only in the form of a prosthetic eye, as in the Podróże mikrokosmiczne profesora Rembowskiego. In what follows, I will be interested in precisely this figure of the micronaut, exposed to the greatest danger of all, what his own sense of sight has become. been sent to manifest that to the nation. Drzewo – ślad. Roślinny złom. separation here has the upper hand over summary – because the object of interest consisted of individual truths about death, private micrologies of dying. In order to read the currents of these micrologies, to find the threads of convention and suffering, grammar and pain, it was necessary – in some measure symmetrically in terms of the writer’s efforts – to repeat their words in one’s own words, to renew the attempt to tear the fabric of language, unavoidable in expressing individual truth, and the attempt to newly patch it together, necessary for the utterance of truth in a comprehensible form. Góra’s epic poem is bottomless and total, but it also preserves a micropoetic, micrological structure: each distich is capable of functioning independently, each is a singularity, each produces an untranslatable idiom and finally gives the reader the last word. We enter our reading in a group of several persons, in some kind of apparent community (“bra-/ cie” [bro-/ther(s), “sio-/ stro” [sis-/ter! )]), only to reach, after over eleven hundred distichs, a final one which is incomplete and perhaps cut-off. “The final line of the final distich is designed to be written by the reader,” Góra informs us in the afterword, entitled “An Attempt at Clarification” (Próba wyjaśnienia) [N, 138], though it invokes a kind of Norwidesque breath rather than any rule of writing: a place of silence, air, void. But this is not the only feature that prompts us to group Nie among “micrologues” in the Czaplińskian sense and the “micrologies” proposed by Nawarecki. References to attempts “to tear the fabric of language” and sew it together again are intrinsically references to the technical side of the poem, because they describe the principle of creation of particular structures, with strong enjambment, including even examples within a single word, with a seeming absence of coordinated conjunctivity of elements and with a nearly total lack of any kind of predicate that would help create a narrative of some sort. For the Nie do not constitute a narrative (I refer to the title using the plural pronoun, as the author stipulates in his Attempt at Clarification), but rather a fabric, a gobelin tapestry, which is ruled by the surface (Deleuze rears his head again) logic of stitching and unstitching, and thus also covering up and stripping bare, sealing and unsealing (the wound), silence and utterance, macrosystem and microexistence, the order of numbers and the order of idiomatic existence, monument and scrap/crumb. That is why I cite Góra’s poem in an essay on micropoetics, surrounded by the theories and methods of: Nawarecki, Foucault, Deleuze; I cite the poem as its creator intended, as an oratorio, and thus a task to be carried out, but also a means itself of practicing micropoetics and the microgaze, which most interests me within that discipline. At the same time, this is my third attempt, within a fairly short scope of time, to write about Nie, as if each time a different, separate fragment were operative, and the “economy of remainder” were again setting increasingly microscopic fragments into vibration. In the introductory part of this work I described the story of Syga and Professor Rembowski (to some extent by analogy to the fable that opens Nie, about a “mouse, our faithful comrade,” which also provides procedural instructions for coping with trauma), moved by that “permanent loss of sharpness of vision in one eye.” In fact, my reading of Unkiewicz was accompanied by a passage in Nie, which could certainly be interpreted in terms of mysticism or post-secular seeking; I, however, think of it in categories of desire, microactivities and their connections with the macrophysics of power: “Patrzeć / ciemności. Ubyć” [To look / darkness. To subside; N, 34]. I thus feel obligated to ask a question not yet posed either by Nawarecki or by any of the texts compiled in the “micrological” volumes: what dangers are concealed within micrology? Who might it hurt, puncture, or shatter? Does it really enable us to look “deeper,” and what are the consequences of that? Who is the master and who is the victim of micrology thus understood? And where does the “literary microscope” itself stand in regard to modernity, with its panoptic nature, or spectacular postmodernity? I am thus interested in a tender and provocative, dangerous micrology, while at the level of genre study I am drawn to its micropoetic equivalent, the linguistic experiment with the forms of life, which should, in spite of all, be called biopolitical. This problem, in its turn, forces us to come to terms with two patron saints who appear only casually in the volumes edited by Nawarecki: Michel Foucault and Gilles Deleuze. Despite the anthropological and sociological deviations toward cultural studies, micropractices, or what Kathleen Stewart has aptly called cultural poiesis, the promise of micrology from Nawarecki’s volumes still remains hermeneutic and therefore exegetic: turning our gaze toward what is smallest and conducting our reading in the most careful and scrupulous way, we straightaway posit the possibility of a structural analogy, a passage fraught with meanings from detail to whole, from the insignificant particular to a totalizing synthesis, which will take place at higher levels of meaning or at successive levels of semiosis (we thus find ourselves following in the footsteps of Barthes’s Mythologies or Eco’s “semiotics of everyday life”, no matter what). Even the idea of the “remainder,” of that which slips away, which endures in defiance of the scholar’s discourse or outside it, acquires enhanced value in this perspective, and the real proportions of forces undergo effacement. To sum up a certain stage in our reflections, we can thus propose three separate approaches to literary “micrology.” With reference to its character of being a “remainder” and to its penchant for the poetics of the fragment, we can perceive micrology as a kind of “defence of defencelessness,” by which what is seemingly condemned to failure and oblivion becomes stabilized, preserved, acquires meaning, i.e., hope. It then continues, in spite of all, the hermeneutic idea of the exegsis of the sacred text, even if the text itself – as in, to name one source, Bruno Schulz’s Księga (Book) – we find to be a newspaper, calendar or matchbox. It is also possible to look at micrology (and thus also every form of micropoetics) in terms of the search for validation for the humanities. In a paradigm dominated by the natural sciences, studies at the micro scale often seem more attractive than those conducted at the macro scale. They offer more certain results, deceive with the promise of direct reference to reality, are less speculative, and therefore less susceptible to error. If humanists’ perception of the humanities in laboratory categories has become a symptomatic tendency, we remain still in the age of the optical microscope rather than that of the Large Hadron Collider. But it is also possible, and this approach seems more promising, to follow Lyotard and propose to see micrology as a consequence of the collapse of the grand narratives, an effect of disenchantment with twentieth century gigantomachy, the claims of Theory to omniscience and definitive judgments. Micrology would then be not so much the promise of a more penetrating and more precise reading (a variant of usurping close reading) as rather an extension ‒ in methodological space – of a tendency issuing from the capitulation of Enlightenment reason, the tendency to write summaries, fragments, notebooks, to exhibit the practical dimension of research and shift the weight onto personal histories and case studies, toward idiomatic, reflective anthropology. It is here that the real field of study for micropoetics finally begins, and for what it might be: not the study of textual particles, gnomes and epigrams, not a search for “cracks in existence” in nonliterary works, in slogans on walls, tombstones, advertisements and instructional manuals, but a specific, situated and self-conscious tactic of operation, aimed at various forms of authority, in other words: the poetics of life in its political dimension. If we look for the foundations of this combination, we must naturally turn in the direction of Michel Foucault and his “microphysics of power.” In seeking to test the fundamental sources of oppression and the forces that shape the subject at the social level, Foucault had to perform a meticulous analysis of old discourses and find in them the traces of shifts between practice and command or norm. He thus tied his microanalysis into a double loop by showing 1) how far into the depths, to life as manifested at its base (even to biological and biopolitical questions), the structuring/parcelling/coercive/sub-you-gating power of the authorities reaches, and 2) to what degree basic actions of individual subjects are capable of slipping out of its grasp or deforming it. After many years of searching for engagement at various levels of discourse, Foucault’s final choice turned out to be ethical-aesthetic “care of the self,” understood as a kind of aesthetics of existence. That is not what constitutes one of Foucault’s greatest achievements, nor even is the introduction of the micrological perspective into the study of power relations, but rather the reversal of influence. If we look at the History of Madness or Discipline and Punish, we perceive that it is not discourse (judicial, penitentiary, medical) that shapes the foundations of desire, sub-you-gates subjects and establishes social reality, but a series of accidental, chaotic, situated practices, inventions, and grassroots procedures which from the beginning have eluded cataloguing. In this sense, the microtechnology of the authorities outdistances ideology and discourse itself, acting independently and in some sense automatically. Series of technological embodiments, rhythmically practiced activities and concretely shared spaces preserve institutions within themselves and only lastly “become visible” to the discourse in whose study Foucault is engaged. If we thus look at the French philosopher’s achievement, perceiving the subject not as the result of social “processing” by the discourses of power, but as an active actor, whose drive sphere, desires and basic impulses always slip free of structurization, or in other words: if we treat as the end point of Foucault’s writings not History of Madness but The Care of the Self, his “aesthetic of existence” turns out to be a micropoetics of dodges, tricks and slippages enabling the defence of the self. In this aspect of Foucault interpretation, the thinker most indebted to him was Michel de Certeau, when he formulated the “poetics of everyday life,” that is, when he designated the frameworks of sociological and anthropological reflection on the forms of everyday life according to a tool from the field of the theory of poetic language. It remains to be asked how we should consider other, equally infinitesimal, procedures, which have not been “privileged” by history but are nevertheless active in innumerable ways in the openings of established technological networks. This is particularly the case of procedures that do not enjoy the precondition, associated with all those studied by Foucault, of having their own place (un lieu propre) on which the panoptic machinery can operate. These techniques, which are also operational, but initially deprived of what gives the others their force, are the “tactics” which I have suggested might furnish a formal index of the ordinary practices of consumption. It is not my purpose, however, to describe the “poetics” of the un-localized subversive activities that de Certeau calls “tactics,” and among which he includes cooking, reading, walking, various forms of translocation or mobility. It seems to me that for some time, at least since the publication of the first volume of the Polish translation of The Practice of Everyday Life in 2008, this knowledge has been assimilated and applied by practically everyone in the humanities in Poland. What I have in mind is rather to convey an impulse that can be traced to Foucault: the fundamental meaning of microorganization and from-below activities, as opposed to the macrostructures of institutions. The needs of the authorities of structural division begin to be met by other types of connectivity, and delocalized activities of evasion or escape, deprived of a place in discourse, which constitute the very material of everyday life, they recall the Deleuzian concept of deterritorialization and have more in common with the economy of desire than might appear from de Certeau’s sociological reading. we are no longer dealing with a demonstration or presentation, nor even with their destruction, but with the dialectical relationship between destruction and construction, between the matter of the thing, from which the seeing subject is divided, and the line of the gaze resting, helplessly, on what has been imposed on it by means of violence. The asyndeton of Góra’s poem reproduces that fundamental tension, but reshapes it into the form of a political protest. Whereas Foucault ceded the power of action to the individual subject, entrusting him with the task of caring for the self, with the consciousness of participation in a collective social mechanism and the possibility of microinfluencing concrete processes, at around the same time Deleuze proposed schizoanalysis as a “micropolitical theory of desire,” aware that it was simultaneously the only possibility for real political resistance within the absorptive, but unceasingly leaky capitalist system. Within his machinism, he thus described a basic division into molar and molecular spheres, identifying molar ties (stable and comprehensive) with the oppressive order of the Institution and molecular with the revolutionary, creative order (desire here is free, not located in any intentional regime assigned from above, and thus does not reproduce its structures and ways of operating). The molecule – to simplify greatly – becomes something like a free electron, capable of joining together with different atoms not for the purpose of reproducing a pattern, but in order to carry out generative transformations and continually escape or (in Deleuzian terms) deterritorialize macropolitical segments. It is true that the flow and its quanta can be grasped only by virtue of indexes on the segmented line, but conversely, that line and those indexes exist only by virtue of the flow suffusing them. In every case, it is evident that the segmented line (macropolitics) is immersed in and prolonged by quantum flows (micropolitics) that continually reshuffle and stir up its segments. Deleuze’s micrology thus lies at the opposite pole from the microscopy of Jakobson or the micrology of Richard or even Bachelard, which ascribed to the image, even the “elementary particle,” a liberating force. It is not concerned chiefly with the meaning of the detail or the attainment of basic, structural “shares” in the work or the text, nor even with scale, as in the original Silesian micrology, but with models of thinking about desire (and thus action): from below and from above, revolutionary and coercive, micro- and macrophysical, models capable of joining individual case studies with a “general theory of everything” (in passing, we must observe that Deleuze’s micrology becomes a subversive version of system theory). Only these models are translatable – through organic (molecular) or technical (molar) metaphors of connectivity – into concrete procedures that we might call linguistic or, more precisely, poetological. It should be remembered, however, that such thinking about machines of desire is not thinking about sizes, but is typically merological: concerned with the relation of the part to the whole. The issue is that the molar and the molecular are distinguished not by size, scale, or dimension but by the nature of the system of reference envisioned. Perhaps, then, the words “line” and “segment” should be reserved for molar organization, and other, more suitable, words should be sought for molecular composition. Molar ties can thus bring together both the order of the Institution and that of the State, block flows of desire, and like molecular ties, they can deterritorialize and thereby set free both groups and individual subjects. The micropolitics proposed by Deleuze, and whose ideal representation we find in his exegesis of Bartleby the Scrivener, takes place according to molecular principles such as the crack, fissure, the cutting and undulating lines that demarcate it, while its spirit remains betrayal, as a refusal to belong to the majority, as a path of becoming-imperceptible, everybody and nobody simultaneously. Disarticulated, deterritorialized, Challenger muttered that he was taking the earth with him, that he was leaving for the mysterious world, his poison garden. He whispered something else: it is by headlong flight that things progress and signs proliferate. Panic is creation. A young woman cried out, her face “convulsed with a wilder, deeper, and more hideous epilepsy of stark panic than they had seen on human countenance before.” No one had heard the summary, and no one tried to keep Challenger from leaving. Challenger, or what remained of him, slowly hurried toward the plane of consistency, following a bizarre trajectory with nothing relative left about it. To write is certainly not to impose a form (of expression) on the matter of lived experience. Literature rather moves in the direction of the ill-formed or the incomplete, as Gombrowicz said as well as practiced. Writing is a question of becoming, always incomplete, always in the midst of being formed, and goes beyond the matter of any livable or lived experience. All we talk about are multiplicities, lines, strata and segmentarities, lines of flight and intensities, machinic assemblages and their various types, bodies without organs and their construction and selection, the plane of consistency, and in each case the units of measure. […] Writing has nothing to do with signifying. It has to do with surveying, mapping, even realms that are yet to come. What happened in that forest? Why is the rain “flesh-coloured”? What is the relationship here between the minority and the majority, the multitude of “we” and the solitude of “I”? If this “lost” is precisely the measure of that relationship, the price of the journey, then in what sense does its absence magnify the subject? Does it magnify or rather falsify? To what degree is this process in the nature of “subsiding”? What or who are “they” (or: “no”) in the last line? We will not learn that from Góra’s poem, because he does not tell about the expedition with brother and sister to the forest; it is not a retelling of Andersen’s fairy tale, though it might seem to be at first. Instead, it takes place in the space of the forest, in an expanse demarcated on the one hand by the materiality of a transformed tree (knag, splinter, slaughter), and on the other by the phenomenology of damaged visual perception: “uchylenie okien od wzroku” [turning windows away from sight; N, 61], “wywołany przez pomylenie wzroku negatyw” [a negative produced by faulty sight; N, 116]. I am thus looking for transitions and openings, while keeping in mind that Nie represents a wound in the process of scabbing, that it is governed by “Zatarcie śladu. Sprostowanie prawdy nie o kłamstwo, o milczenie” [the effacement of a trace. Truth’s corrective not to a lie, but to silence; N, 96]. I am looking for linguistic material in the phase of becoming, which leads me to the prefixes “prze-” (pre-: over/before; also trans-: across, through) and “przed-” (pre-: before), which generate whole chains of tensions. The first of these, according to the PWN Dictionary of Polish Language, intensifies the meaning of adjectives and endows verbs with a new shade of meaning: spatial, temporal or relational. The second creates compounds which, depending on the context, signify anticipation, antecedence or precedence or can describe the relation of an action to someone. We thus have a whole chain of “Leśmianisms,” leading into the past, to a time before matter took its current form: “przedrzeczy” (pre-thing), “przedsen” (pre-sleep / pre-dream), “przedjęzyk” (pre-language), “przedpamięć” (pre-memory). We have everything that signals space and the moments or places of transition I have been looking for: “przepływ” (flow), “przepadek” (forfeiture), “przełyk” (gullet / esophagus), “przepita” (drank), “przeprawa” (passage), “przestój” (standstill), “przeskok” (leap), “przepaść” (precipice, abyss), “przebicie” (perforation, puncture). We have an intensification of the meaning of words, leading to a specific kind of hyperbolization, as if each gesture or form of existence in Nie were displaced in time: “przeoczenie” (oversight), “przemilczenie” (passing over in silence), “przebudzenie” (awakening), “przełamanie” (break), “przemnożenie” (multiplication), “przedłużenie” (extension), “przeciągnięte” (drawn-out), “przerysowane” (exaggerated), “przesycone” ([over]-saturated), “przeznaczone” (destined), “przemyślane” (thought through), “przeżarte” (eaten up), “przecierające” (liquidizing/wearing through). These are just a few examples, and though in the course of reading, the explosive nature of these slippages ‒ of spatial shift or temporal extension ‒ operates more at the level of affect, the juxtaposition as presented above looks more like a dictionary game, as if Góra had selected certain headings and proceeded letter by letter through a bravura stylistic exercise. Odprysk, // przejście mrozu w/ pieszczotę [Splinter, / passing of frost into / caress; N, 79]. What we see here is rather “przejście” as a shift in intensity and meaning, as a transition between crack and inflammation, as a “path to power” (hyperbole again), as in the “passing of frost into caress” or the shift into a state of rest ‒ the form of the substance changes, but not in terms of a change of its state of concentration or the transformation of one kind of matter into another. No alchemy takes place in Góra’s poem; instead, a transmission of intensity through words, as in a children’s game of “kick the can”: a crack is, after all, in a certain sense, a passage (the cracks of existence), a knag quite literally is an intensified transition, an overgrown remnant (in this sense a transition in time as well, a kind of bridge). At the microlevel, the logic of Nie could thus be described as a logic of transitions, but not in the sense of steps (Derridian pas), rather transferences, not as continuation of the story of the journey into the woods, but rather as a fairy tale of struggle with trauma, understood as a block to flow, an end to the road. Everyone knows what metaphors have hitherto been drawn from the Deleuzian project and employed as tools in Polish scholarship. The first stage involved focusing on rhizomes and the rhizomatic as narrative, grammatical or hypertext structure; the category of nomads was used in the context of postcolonial reflection, the philosophy of difference and the problems of otherness, and the concept of deterritorialization as language’s diversionary power has also been made use of to expropriate the subject from the structures of power. A rather abundant current in scholarship concentrated on the idea, borrowed from Deleuze, of the body without organs, and in literary criticism, machinism is slowly beginning to be accepted, as well as the reflection on desire that derives from it, no doubt due to the recent productive work by our humanities scholars on the theme of affects. Using this quotation as his motto, Franco Berardi created his own version of the microcritique of semiocapitalism, in which the language of poetry makes possible the generation of conjunctive concatenation rather than connective concatenation. Such a language thereby maintains a capacity for infinite productivity, for the liberation of desire and the movement of deterritorialization. Berardi thus duplicates – on the plane of grammar, in the smallest structure of conjunctions (hence the title of his book, And) – the Deleuzian opposition between molar segmentation (connection) and molecular productivity (conjunction). As long as another word can be added to the utterance, and the elements in the sentence do not duplicate a model assigned from above, there will be no end to the story. “To look darkness” does not in any way correspond to “seeing darkness,” and thus does not boil down to a simple statement of an objective state of reality. The very opposition of looking and seeing is a recurring one since Góra’s early work, probably exhibited most openly in the poem “W fabryce” (In the Factory), which speaks of an “eye of looking” and an “eye of seeing” and the mutually interchanging possibilities of observing and experiencing, witnessing and participating. If we consider that Nie employs and problematizes a poetics of witnessing, that it too is, in its way, a kind of testimony, or, as I would prefer to call it, “an over-sighting of testimony,” then the phrase “to look darkness” sets in motion the play of tensions fundamental to the book. We must first of all consider the positive interpretation of this utterance not as an anacoluthon, but as a correct compositional construction. That leads us to note the now-archaic use of the verb “patrzeć” with singular nouns in the genitive case, as in “patrzeć zimy” (see winter) in a poem by Miłosz, or “patrzeć jutra” (see morning). Archaicization and regionalization are frequent elements in Góra’s idiolect, so that here too, the presence of such a device should not be ruled out. That would suggest the expression contains the meaning of “looking out for” something in the sense of “expecting,” and thus – returning to the context of the poem – encroaching darkness, i.e., nightfall. Let us assume, however, that it is a broken sentence, that “ciemność” is singular and is personified, that it is performing the function effected by the dative case. The expression “to look darkness” would then be equivalent to the formula “to look someone/something in the eye(s),” as well as the phraseologism “eye to eye.” It would thus evoke a situation of potential conflict, but also efforts to reach an understanding, the violation of the boundary between the looking self and the object being looked at. But what if “ciemności” is actually “darknesses,” accusative plural, and not dative singular? Then these darknesses turn out to be the object of the gaze, or possibly its mode. And thus we are looking at darknesses (and in fact there is no “we,” no person here at all – there is only a bare action, an injunction), we are eliciting shapes from them, or perhaps ‒ and this solution is the one toward which I am more inclined – we are beckoning the darknesses themselves. The process of looking is then revealed not as a cognitive process in the sense of Enlightenment philosophy, with the promise of leaving the Platonic cave, but creative (poietic), not as fixing our eyes on darkness or even as an existential situation (looking within darknesses, cognitive inability), but rather as the duplication of darkness with the help of the power of sight. As if sight itself elicited the darkness in an object, as if the way of being proper to it was in fact “the work of darkness.” Not only is speech dark, then, and it is not only the “oversight,” recurring in Nie with the force of a judicial indictment, that makes the source object disappear. This fundamental ellipsis, eliminating the preposition between “darkness” and “looking,” removes all indications of their mutual connectivity, placing the reader in a dark game of overlookings. I claim, however, that oversight is not the most important form of intensification at stake in Góra’s poem; that would be combination, felt, as Berardi understands it, as conjunction, and, as Deleuze understands it in his rhizome, as a “covenant.” Yet the iterations of “1” in the distichs’ formal arrangement do not signify sequence or consequence, do not introduce divisions in terms of power, and nor do they add up to the real number of victims of the catastrophe, as Góra’s introductory postulates announced (aside from the fact that the number of victims is itself uncertain, we do not in fact know at which distich the poet stops); they are in fact a kind of “covenant,” a combination created on the basis of conjunction, corresponding to molecular multiplicity. The radical division from the beginning of the poem, the enjambments in vocative case of “sio-/stro” and “bra-/cie” is thus not a final division: it is merely the consciousness of divisions and segmentations, inscribed in every subject, a kind of fissure. The next step thus needs to be taken outside oneself. Konrad Góra: I took a poetic technique from Bly that could somehow be married to divesting from yourself and simultaneously with the non-preponderance of existences over necessity […] I had the most memorable experience with that method in Poznań, where I got a work-room in the basement of the od:Zysk [squat]; I sat there as far down as you can go, in the middle of the [ground beneath the] town square, in darkness, and the only thing that could happen there – besides the fact that I eavesdropped on the people walking over me, and found it to be an event when somebody went silent, because that is an event, since in fact people are talking all the time – there was a rat, reddish-haired, I called him Kaiser, and he came out to where I was every once in a while, in the end we finally had a lasting bond, I brought him bread and peppermints […]. I thought that I had driven him away from od:Zysk, because I knew they would come in there with exterminators, but the day before yesterday Łojek from that crew told me that Jezus, one of the dogs there had killed the rat. Dawid Mateusz: So it’s quite a time-consuming method and one that doesn’t operate without claiming its victims. Konrad Góra: It opens up to more than it closes off. They say that he who looks for too long at the sun will eventually go blind, but what about he who looks into the inner darkness? A micronaut is something like Blanchot’s Orpheus ‒ like him, he looks into a blind spot, in the centre of night, and like him he doesn’t see, so he immerses himself in the darkness of the text, revolves gropingly, experiences his own smallness, sub-sides in it. This essay undertakes an attempt to complete the “micrological” perspective of the Silesian school led by Aleksander Nawarecki with political impulses absent from its sources, guided by the intellectual constellations of two thinkers hitherto neglected as micrologists: Michel Foucault and Gilles Deleuze. Voicing opposition to the discipline and scientism of the close reading method, the essay proposes to consider the scholar in the categories of the micronaut, and the process of reading as immersion in the text, following minor tensions and flows of meanings. It simultaneously attempts a philosophical reading of the long poem Nie by Konrad Góra as a study in the methodology of seeing, (un)committed blindness and political multiplicity. G. Deleuze, Negotiations 1972‒1990, trans. Martin Joughin, New York: Columbia University Press, 1995, p. 25. T. Unkiewicz, Podróże mikrologiczne profesora Rembowskiego (The Micrological Travels of Prof. Rembowski), second edition, Warszawa 1962, p. 8. M. Blanchot, The Gaze of Orpheus, trans. Lydia Davis, ed. P. Adams Sitney, New York 1981, p. 99. Miniatura i mikrologia literacka, ed. A. Nawarecki, vol. 1 (2000), vol. 2 (2001), vol. 3 (2003) ‒ referred to heretofore as MiM with designated page numbers. Skala mikro w badaniach literackich, ed. A. Nawarecki, Katowice 2005. A. Nawarecki, Mały Mickiewicz. Studia mikrologiczne (Little Mickiewicz. Micrological Studies), Katowice 2003, p. 11. E. Domańska, Mikrohistorie. Spotkania w międzyświatach (Microhistories. Meetings in the Interworlds), Poznań 2005 (I quote the updated and expanded second edition, Poznań 2005). P. Czapliński, Mikrologi ze śmiercią. Motywy tanatyczne we współczesnej literaturze polskiej (Micrologues with Death. Thanatic Motifs in Contemporary Polish Literature), Poznań 2001. P. Michałowski, Miniatura Poetycka (Poetic Miniature), Szczecin 1999. J. Brach‒Czajna, Szczeliny istnienia, Warszawa 1992. Ewelina Szułek further pursues this topic as well as addressing the potential “innovation” of the Silesian micrological method: “Moda na małe? Innowacyjność śląskiej mikrologii literackiej” (A Fashion for the Small? The Innovation of Silesian Literary Micrology), Postscriptum Polonistyczne 2016, no. 1 (17), pp 179‒191. R. Sulima, Antropologia codzienności, Kraków 2000, pp. 8 –9. A. Nawarecki, “Czarna mikrologia” (Black Micrology), in: Skala mikro…, pp. 9‒24. See E. Domańska, M. Loba, Introduction to French Theory w Polsce (French Theory in Poland), ed. E. Domańska, M. Loba, Poznań 2010, pp. 7‒20. ed. W. Bolecki and R. Nycz, Warszawa 2002. Nawarecki, Mały Mickiewicz, p. 11. Nawarecki, Mały Mickiewicz, p. 14. F. Lyotard, “The Sublime and the Avant-garde,” translator uncredited, Paragraph, Vol. 6 (October 1985), p. 15. A. Nawarecki, Introduction, MiM, vol. 2, p. 9. Nawarecki, Rzeczy i marzenia. Studia o wyobraźni poetyckiej Skamandrytów (Things and Dreams. Studies in the Poetic Imagination of the Skamander Poets), Katowice 1993. Tenże, Introduction, MiM, vol. 2, p. 22. 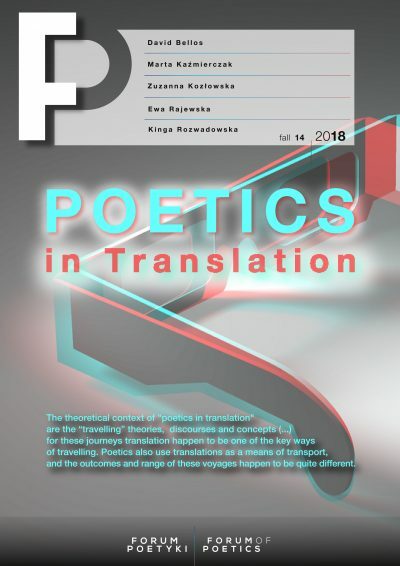 Tomasz Kunz wrote recently on the cultural transformation of poetics and the related marginalization of literature: “Poetyka w świetle kulturoznawstwa” (Poetics in the Light of Cultural Studies), Forum Poetyki 2015, no. 1. P. Jędrzejko, Oscylacje literackie, czyli od Gadamera do mikrologicznej krytyki świadomości (Literary Oscillations, or From Gadamer to a Micrological Critique of Consciousness), MiM, vol. 2, p. 29. See the very interesting text on Jakobson’s “microscopy,” juxtaposing two different analyses of a Baudelaire poem by Jakobson, five years apart: B. Mytych, “Mikroskopia Romana Jakobsona” (Roman Jakobson’s Microscopy), MiM, vol. 2, pp. 19‒26. K. Góra, “Wrocław,” in: Requiem dla Saddama Husajna i inne wiersze dla ubogich duchem (Requiem for Saddam Hussein and other Poems for the Poor in Spirit), Wrocław 2008, p. 7. K. Góra, Nie, Wrocław 2016, p. 9; heretofore designated in the text as “N” followed by the page number; where necessary, I omit verse or line divisions, numeration, and other compositional elements of the original in my quotations from it, focusing solely on the production of meanings. Even if only in such a variant of it as “biopoetics” in Przemysław Czapliński’s understanding of that term in “Resztki nowoczesności” (Remains of Modernity), in Resztki nowoczesności. Dwa studia o literaturze i życiu (Remains of Modernity. Two Studies of Literature and Life), Kraków 2011, pp. 271‒294. My analysis leads me to believe that throughout the four volumes of Miniatura i mikrologia literacka Deleuze and Foucault appear sporadically and on the basis of false premises or associations, not actually related to microperspectives. In the first volume, Deleuze, together with Guattari, is mentioned in the opening essay by Nawarecki in a parade of names, as a continuator (sic) of the Marxist path and heir to the Frankfurt School. In the second and fourth volumes, he returns completely at random, as a representative of thinking in terms of opposites in the deconstructionist tradition (and the author of Différence et Répétition), while in the third he appears only marginally, as a commentator on the thought of Bergson. Foucault fares no better: in the first volume he barely represents a voice responding to Barthes’s “death of the author,” in the second he appears in a cycle of deliberations, but nobody devotes a whole essay to him, as other entries are devoted to Jakobson, Bachelard and Barthes, and from the third and fourth volumes he is entirely absent, as if the historical and discursive “microphysics of power” were not important for literary micrology. As can be seen from the above enumeration, micrology has certain lacunae in need of remedy, at which the present essay can represent a first attempt. K. Stewart, “Cultural Poiesis: The Generativity of Emergent Things,” in Handbook of Qualitative Research, 3rd Edition, ed. N. Denzin, Y. Lincoln, Thousand Oaks: Sage, pp. 1015‒1030. This residual gleam of hope, a truly Benjaminian inclination, can be perceived even in such a melancholic and pessimistic diagnosis as we find in Sulima’s book: “The undulating inflow or outflow of things tears the thread of tradition […]. Reports show, in the perspective of individual experience, not so much ‘how it is,’ how something lasts, but rather how something ‘vanished’ or ‘vanishes.’ Thus inscribed into these reports are sequences of ‘historicity’ which help to understand perhaps not so much the present as it ‘passes’ as rather the ‘oncoming’ present” (Sulima, p. 9). Nawarecki devotes a separate footnote to this category, joining theology to the “economy of remainders” (see Nawarecki, Mikrologia…, MiM, vol. 1, p. 21). See Nycz, “W stronę innowacyjnej humanistyki polonistycznej: tekst jako laboratorium. Tradycje, hipotezy, propozycje” (Toward an Innovative Polish Studies Humanities: The Text as Laboratory. Traditions, Hypotheses, Propositions), Teksty Drugie 2013, nos. 1‒2; A. Żychliński, Laboratorium antropofikcji. Dociekania filologiczne (The Laboratory of Anthropofiction. Philosophical Inquiries), Poznań/Warszawa 2014; Ł. Afeltowicz, Laboratoria w działaniu: innowacja technologiczna w świetle antropologii nauki (Laboratoria in Action: Technological Innovation in the Light of the Anthropology of Science), Warszawa 2011; Afeltowicz, Modele, artefakty, kolektywy: praktyka badawcza w perspektywie współczesnych studiów nad nauką (Models, Artefacts, Collectives: Scholarly Practice in the Perspective of Contemporary Studies of Science), Toruń 2012. One might ponder the application of micropoetics as a method of reading micropoetries, which, adhering to the The Princeton Encyclopedia of Poetry and Poetics, we define as accidental, peripheral literary forms, created by amateurs, rather a kind of ephemeral cultural practice than a work or artefact, and to a great extent dependent on social context and the temporary mode of functioning of a given community. See M. Damon, Postliterary America: From Bagel Shop Jazz to Micropoetries, Iowa City: University of Iowa Press 2011. See B. Banasiak, “Michel Foucault – Mikrofizyka władzy” (Michel Foucault – Microphysics of Power), Literatura na Świecie (World Literature) 1988, no. 6 (203). lib.org, https://libcom.org/library/intellectuals-power-a-conversation-between-michel-foucault-and-gilles-deleuze [accessed 6 May. 2017]). M. de Certeau, The Practice of Everyday Life, trans. Steven Rendall, Berkeley 1984, p. 49. R. Barthes, The Pleasure of the Text, trans. Richard Howard, New York 1975, p. 12.
 de Certeau, The Practice of Everyday Life, p. 101. J. Derrida, Mémories d’aveugle, Paris 1999. Quoted in: Momro, Widmontologie…, p. 17. G. Deleuze, F. Guattari, A Thousand Plateaus, trans. Brian Massumi, London 1987, p. 218. G. Deleuze, F. Guattari, Anti‒Oedipus. Capitalism and Schizophrenia, trans. R Hurley, New York 2004, p. 116. See G. Deleuze, C. Parnet, “Many Politics,” [in:] Dialogues, trans. H. Tomlinson, B. Habberjam, Columbia University Press: New York 1987, pp. 124‒148. Deleuze, A Thousand Plateaus, p. 217. See Deleuze, “Bartleby, or the Formula,” trans. Michael W. Greco, Essays Critical and Clinical, New York 1998, pp. 68 –91. Deleuze, A Thousand Plateaus, p. 73. On the subject of the “philosophy of abnegation” and its political dimension, see: M. Herer, “Bartleby and his brothers or the political art of refusal,” Dialogue and Universalism, no. 2/2016. Deleuze, Essays Critical and Clinical, p. 1. Deleuze, A Thousand Plateaus, pp. 4‒5. F. Berardi, And. Phenomenology of the End: Sensibility and Connective Mutation, Cambridge, Massachusetts 2015. F. Berardi, The Uprising. On Poetry and Finance, Los Angeles: Semiotext(e) 2012. Deleuze, A Thousand Plateaus, p. 25. “I call conjunction a concatenation of bodies and machines that can generate meaning without following a pre‒ordained design, nor obeying any inner law or finality. […] Connection, on the other hand, is a concatenation of bodies and machines that can generate meaning only following a human‒made intrinsic design, only obeying precise rules of behaviour and functioning” (Berardi, And..., op. cit.). “Teraz to widzę okiem widzenia/ Teraz tam patrzę okiem patrzenia” (Now I see with the eye of seeing / Now I look with the eye of looking) ‒ Góra’s poem begins with these lines (K. Góra, “W fabryce” [In the Factory], [in:] Requiem…, p. 60). T. Sławek, U‒bywać. Człowiek, świat i przyjaźń w twórczości Williama Blake’a (Sub-siding. Man, the World and Friendship in the Works of William Blake), Katowice 2001, p. 252. K. Góra, D. Mateusz, Jeszcze nikt nie oślepł od odwracania wzroku (None Has Yet Gone Blind From Turning Sight Away), http://www.biuroliterackie.pl/biblioteka/wywiady/jeszcze-nikt-nie-oslepl-od-odwracania-wzroku/ [accessed: 30.01.2017].